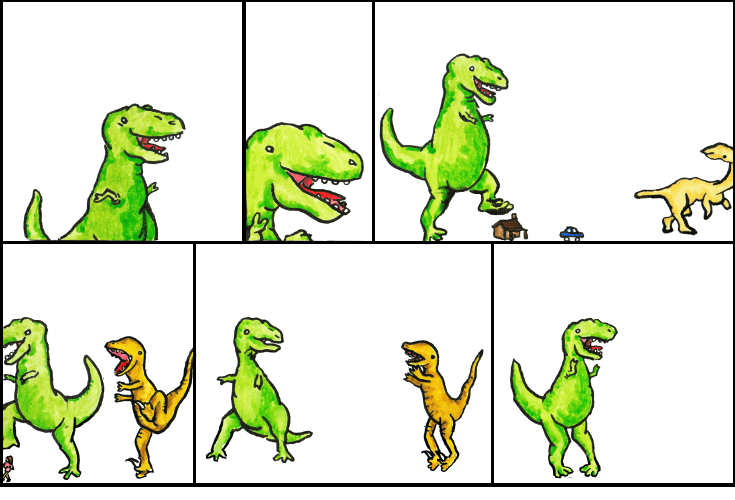 Dinosaur Comics - February 25th, 2011 - awesome fun times! –I can do the saddest FIVE word story: "For sale: baby shoes, unworn"! Tada!! February 25th, 2011: I actually met Professor Cook (the human one, not the dinosaur one with the same name that T-Rex is referring to) when I was at U of T and studying computational linguistics. He is an impressive man, and it was an honour to be in the same room as him. If you want to donate to help the victims and survivors of the earthquake in New Zealand, the New Zealand Red Cross can help, and you can also use Give A Little to donate; they're sending 100% of the funds to the Red Cross there. One year ago today: deleted dialogue: "When i die cool dies with me! Tell everyone so they don't forget."